The Apple logo, iPhone, iPod touch, iPad, iTunes Connect and iTunes are trademarks of Apple Inc., registered in the U.S. and other countries. This guide is not associated with Apple. I made this guide to help beginners to get started with developing for iOS. The content shown in the screenshots is property of Apple Inc. If anyone feels offended by the content of this guide, don’t hesitate to contact me directly. I’ll give my very best to solve the issues then. 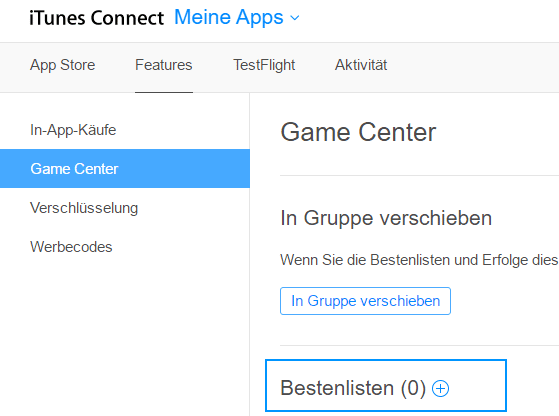 In order to create a leaderboard using GameCenter, login to your developer account and select your application. Click on “Features” and select “GameCenter” in the left navigation area. Then click on the (+) symbol next to the Leaderboard text. On the next page you can either select a single or a combined leaderboard. If this is your first leaderboard, you have to select the “Single Leaderboard”. On the next screen enter all needed information. Moreover you have to add at least one language. Click on Save if you are satisfied with your settings. Use your set leaderboard ID for the GameCenter Integration later (for example in Construct 2).